This is not your average New Hampshire science field trip. From the outside, it doesn’t appear extraordinary. The classic yellow schoolbus is heading out on an itinerary that gives students a glimpse of a local watershed: a visit to the Hubbard Brook Experimental Forest, a scenic drive through Franconia Notch, and a stop along the Pemigewasset River for a demonstration of water analysis equipment. Nothing unusual. Until you step onto the bus. First, the students are all adults. Some of them are high school science teachers from around the state. The rest of them are from halfway around the world—Pakistan, to be exact. 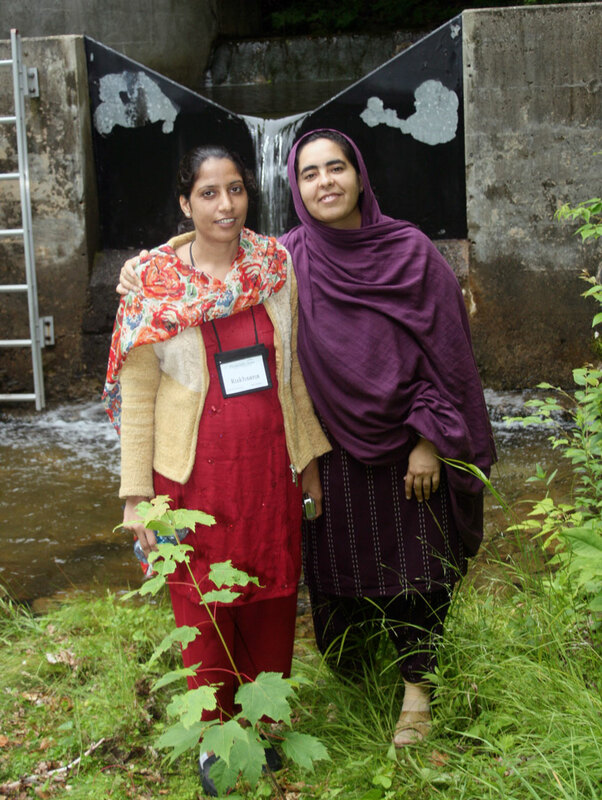 The two groups are working together on projects for an international watershed studies seminar, part of a U.S. Department of State-funded Pakistan project hosted by Plymouth State University and its sixth annual Pakistani Educational Leadership Institute (PELI). Each summer, educators from across Pakistan travel to PSU to take part in the intensive, month-long institute, learning about American educational innovations and how to translate them for use in schools at home. The educators represent the wide range of cultures and communities that are part of Pakistan. Some come from large cities like Karachi, with an estimated population of 18 million; others come from the sparsely populated mountains of Kashmir or the deserts of Baluchistan. They are educators in public and private secondary schools and professors in teacher training institutions. 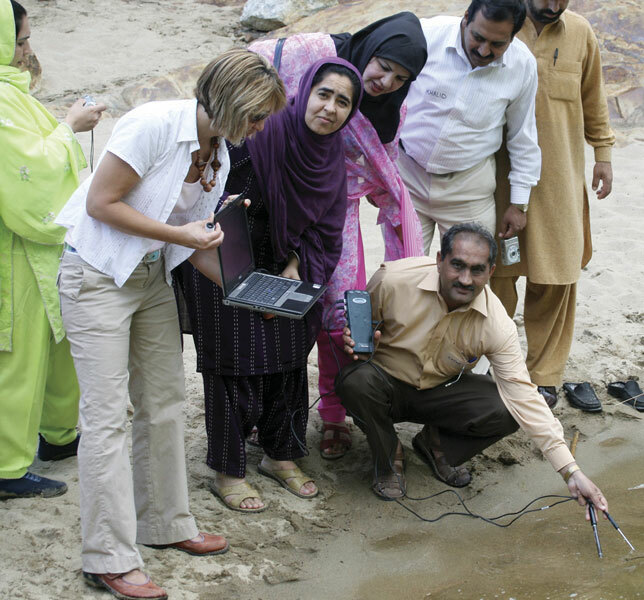 Allen works closely with the U.S. Department of State’s Bureau of Educational and Cultural Affairs, Office of Citizen Exchanges, which provides the funding for the project and PELI, and with a partner Pakistani organization, Idara-e-Taleem-o-Aagahi (ITA) Centre for Education and Consciousness, which was founded in response to the “profound crisis of education” in that country. 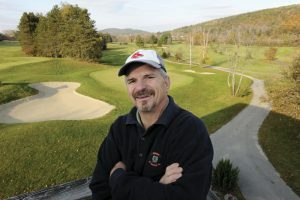 “The goal is to create a far-reaching ripple effect,” says Allen. The project trains educators here at Plymouth State who in turn train other educators when they return home. PELI alumni have reported sharing their institute knowledge with more than 100,000 of their colleagues across Pakistan since 2004. In the seats around her, PELI participants take in the scenery and get to know their New Hampshire counterparts. They discuss history, their jobs, and the weather. “Does it snow here?” one young woman asks, sending the locals into fits of laughter. They also talk about their long days in the institute—they generally are in classes and seminars for 12 to 13 hours each day. Associate Professor of Science Education Mary Ann McGarry, one of the PSU faculty members leading the field trip, makes an announcement on the bus: “At the next stop, we can have tea.” The Pakistanis react with cheers. Amra sinks back into her seat, smiling. “I cannot work without tea,” she says. The bus pulls into the Old Man of the Mountain Museum parking lot in Franconia Notch State Park, where everyone gathers for tea, hummus and crackers, and ginger cookies at picnic tables shaded by birch trees. One group walks to the Old Man’s former viewpoint near Profile Lake, where the Pakistani educators admire the scenery and snap photos. They’re enjoying this trip into rural New Hampshire, a short respite in a fast-paced month. Along with watershed studies, this year’s institute features instruction on conflict resolution and using art in education, as well as trips to Boston and Washington, D.C., where they’ll meet with Pakistan’s U.S. ambassador. The participants also visit local schools and participate in community events around Plymouth. “It’s been great to see the interest build in the community over the years,” Raza says. “People have been very welcoming, and the interactions help expand the views of local citizens as well as the PELI participants, many of whom come from rural areas. It’s those relationships—with the participants, alumni, and ITA—Allen says, that help the PSU staff and faculty involved with the project to understand the needs of Pakistani educators and create programs that will be truly valuable for them. “This is an extraordinary opportunity for everybody involved, in these two countries, to get to work with real people, real teachers,” she says. 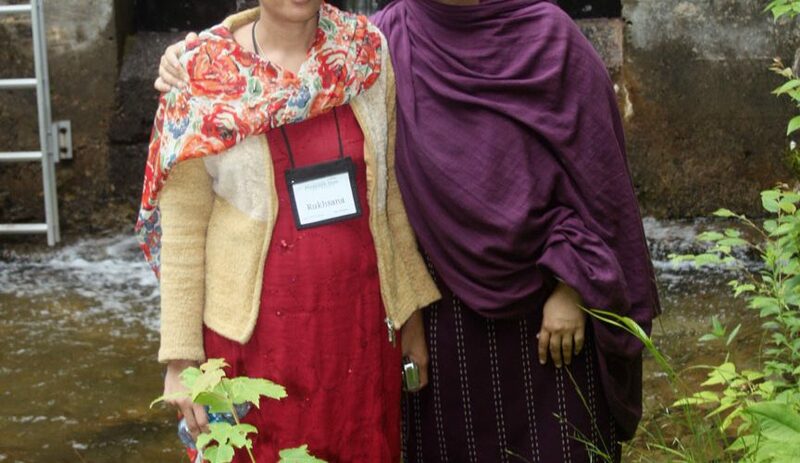 “They are the ones who are trying to effect change in unbelievably challenging situations.” As examples, she cites a PELI alumna who has seen the Taliban take over her girls school in the tribal areas, and another head of a tribal girls school who travels five hours roundtrip in dangerous conditions simply to get to work each day. The project encompasses both the intensive institutes at PSU and follow-up activities in Pakistan. Part of the project’s support efforts include a three- to four-month in-country program for participants when they return to Pakistan, following up on the educational action plans they form in Plymouth and preparing them for success in their own communities. Those who have computer access also can keep in touch through a blog , and ITA offers activities and a support network for PELI alumni. As a final step in completing their training in Plymouth, the Pakistanis gather with Allen and PSU’s “Team Pakistan” of campus-wide staff, faculty, and community volunteers—after an intense month together, everyone involved has become a close-knit group—to deliver capstone project presentations and discuss how they will use what they’ve learned when they return home. Raza speaks about the program’s “extremely collaborative partnership, which is truly a cross-cultural exchange.” The participants discuss the communities and jobs they will be returning to and what they hope to achieve there. “The greatest experience we have had over here is the relationships we have built with all of you. “The institute doesn’t stop here. It goes on in various directions and various ways. From here onward, what we’re raring to do is carry this experience forward and share what we have learned here—not just the classroom learning, but the whole experience. That is going to have a ripple effect. “We come from geographic areas all over Pakistan, from all different positions. We are able to influence many, many educators. We have come up with plans that relate to our own particular contexts. “These ideas won’t only stay in educational institutions. They will affect the general public. All of this translates into us being ambassadors for a new way of thinking, a new way of practice … breaking down cultural barriers to be able to work at grassroots levels. To be teachers without frontiers.